When you get your regular paycheck, it can be shocking to see the amount of money deducted from your take-home pay, but many employees opt to have additional deductions for employer-sponsored health insurance plans. While seeing the money come out of your paycheck might cause some initial sticker shock, it can also offer you benefits such as paying insurance premiums with pretax dollars. Deductions for employer-sponsored health insurance plans are part of a set of deductions called voluntary deductions. Other voluntary deductions include 401(k) contributions, life insurance plans, employee stock options and similar benefits. Your employer can't deduct these items without your explicit permission and, if you decide you no longer want insurance deducted from your paycheck, you can request that the deductions stop. Health insurance premiums are tax deductible, and most employers set up insurance payroll deductions so that you don't pay taxes on the deduction. Employers who do this must offer "cafeteria plans," which allow employees to voluntarily opt for tax-free deductions. Some employers may structure their deductions differently. You might, for example, notice that your deduction is deducted after taxes are taken out. Asking your employer to change his approach to deductions is one possibility, but you can always deduct the cost from your taxes when you file them. Payroll deductions mean that you never have to worry about making timely insurance payments. You're also not stuck getting money that you'll have to part with; instead, the money is never handed over to you, which means you might not miss it. When your employer offers a health insurance plan, the cost savings can be significant; employers are generally able to bargain for lower prices and most pay a portion of the premiums as a part of employee compensation. How Many Deductions Can I Claim on My W-4 Form? When Does COBRA Insurance Start? What Is Deducted From Social Security Retirement Benefits? If you're in financial trouble and don't have major health problems, insurance deductions might not help your financial state. These deductions can also make it difficult to budget when you start a new job. 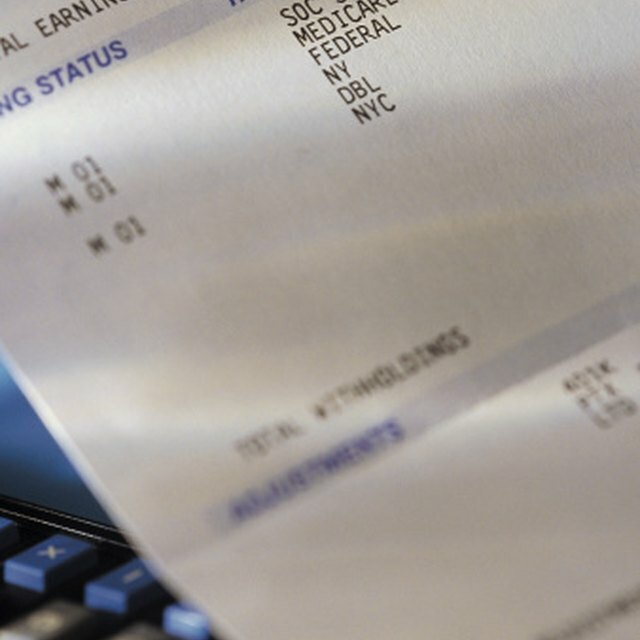 The combination of payroll taxes and voluntary deductions might cause you to overestimate how much money you'll be making with your first few paychecks. Bankrate.com: Payroll Taxes on Health Insurance? Van Thompson is an attorney and writer. A former martial arts instructor, he holds bachelor's degrees in music and computer science from Westchester University, and a juris doctor from Georgia State University. He is the recipient of numerous writing awards, including a 2009 CALI Legal Writing Award.